I haven’t been as swift with unpacking as I probably should have been since we moved in. But, it is what is, and regardless of my characteristic procrastination, my workroom is slowly, slooooowwwwly coming together! Excitement plus! Although this is tempered with the fact that if you saw my bedroom you might judge me. Harshly. But, never mind that; here’s a little bo-peep at my workroom! It shouldn’t be long before it’s all done and dusted, but probably not until I get back from visiting the fam. The only thing that’s really bothering me about it so far is that I want a better way to store my yarn. Plastic crates are functional, but they’re not all that pretty. Meanwhile, I picked up some origami papers from Tokuya – my favezies! – and for the last week or so I’ve made a crane here and a crane there while I watched podcasts and browsed the net, and when I ran out of papers I strung them together! Ever since I read Sadako And The Thousand Paper Cranes in primary school I’ve had a special place in my heart for these little pretties. I remember when I went to Japan with school, we got to go to the Hiroshima Peace Park and see her statue. I burst into tears! I let the group go ahead and I stayed with her for a good half hour or so (as long as I could without losing the group), and there was a nearby shrine full of cranes, so I made some and left them there. It was one of the most special experiences I’ve ever had. Geesh, I’m such a bleeding heart! Hi Jenna! Now that it’s starting to come together I’m getting really excited. It’s been a long time since I had room for my computer… and my sewing machine… and a serger… and a comfy chair to sit and knit. It’s all a bit much to take in so far! 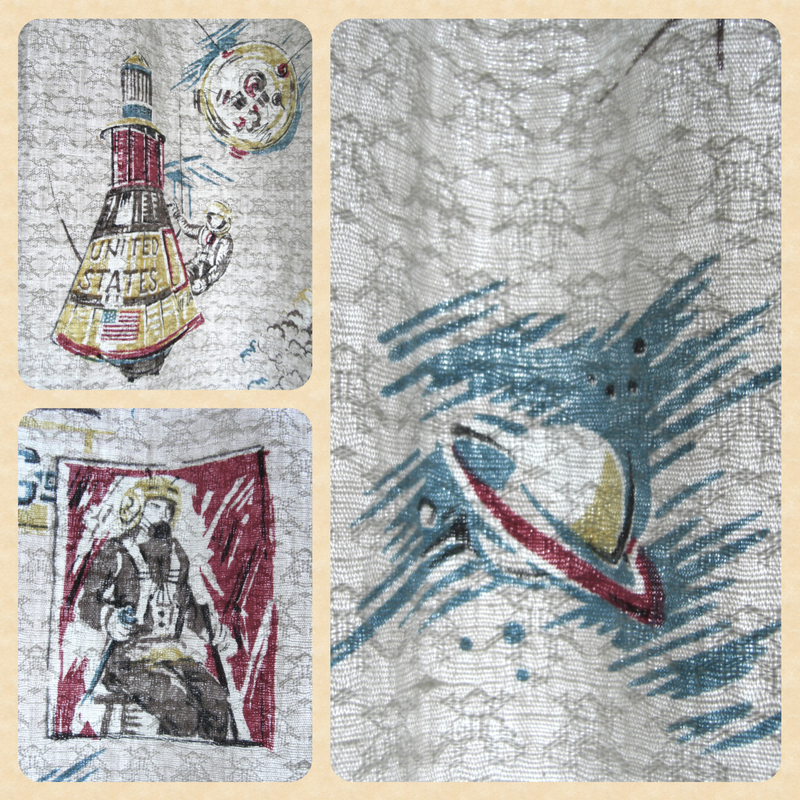 I got the curtains in a big batch of vintage fabric I bought from a friend who was clearing out. They were a pair, but one piece had a few holes and such so I made a bag out of it. A single piece fits my window just perfectly though! A Workroom…I love the thought of it though I think I’d be just as prone to the Unfinished Project syndrome that I suffer from. Your space looks inviting and I love your vintage curtains too – what a find! I tend to have little collections of found objects like gemstones, feathers, sea-glass or shells. 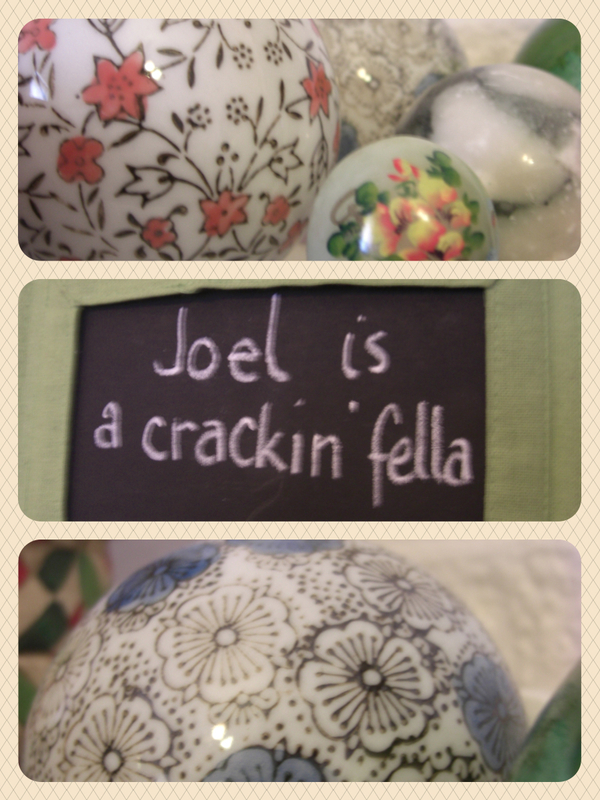 These are in small bowls or handmade baskets here and each has a little memory attached to them. Well, don’t speak too soon, Melissa! I haven’t finished just yet, and I’m also a bit prone to Unfinished Project Syndrome. Oy! Just wanted to say Hi and I like your blog! I have been lurking and looking at it for a bit, but have now dealt with my commitment issues and am following. lookin’ good! i have an owl and moose problem. that and brightly colored plastic baubles. Mooooooooses!? I love it! I’m trying to think of the last time I saw a moose motif or trinket, and I’m sad to say that all that comes to mind are Moose yo-yos. Do you remember those? Oy. I loved yo-yos. But I digress… I need more Moose in my life! I have a recurring “cat hair” decor thing going on. Also roses and prints. Anything with a floral print on it – cushions, bags, tablecloths, most of my wardrobe…I just can’t go past a floral. Depending on what you think is cute, I recommend cardboard fruit boxes for yarn storage. if you keep the yarn balls on their end you store everything in a single layer but you can have a double layer if you lie them down. No more diving into the depths of a plastic tub to get something at the bottom (and mixing up all the layers on top in the process). Depending on whether you think fruit boxes with farm names and fruit pictures are cute of not, you can stack the up in the corner. I think they are more attractive than plastic bins anyway. There is a pic here http://www.littleyellowcat.com/?p=502 of the ones I use for my stash but it’s not a great picture. The boxes I have are covered in pictures of apples and oranges and trees. Let me know if you need some and I’ll bring them in. The local supermarket gives them away. These peeks of your workroom look wonderfful! 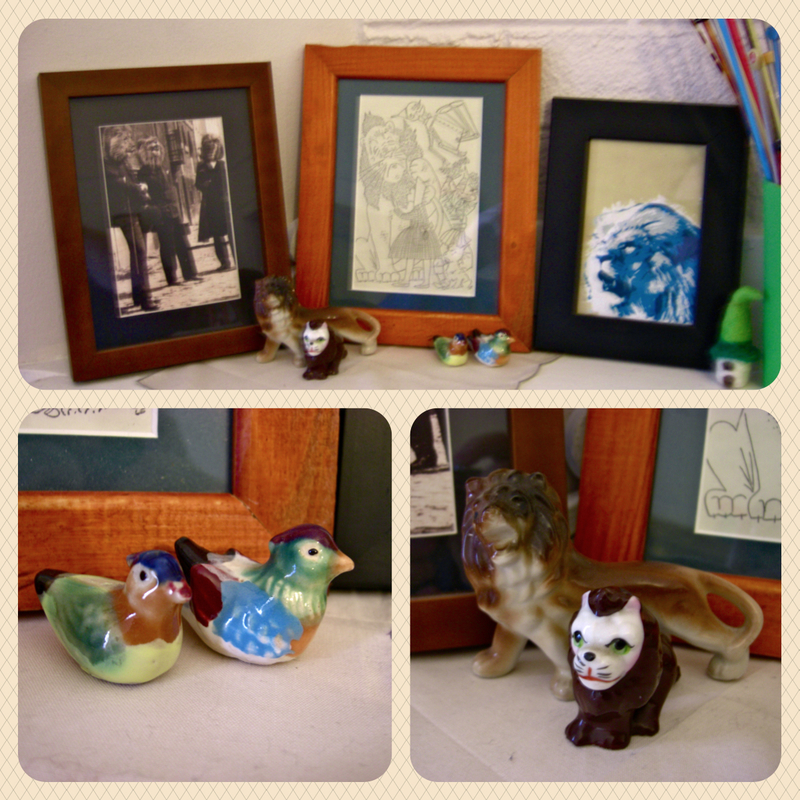 Our crafty room is the one room that NEVER appears on our blog because it is such a disaster zone. And we still haven’t finished unpacking either (we have a few boxes that have been moved from house to house and never been unpacked!) so you’re not alone! 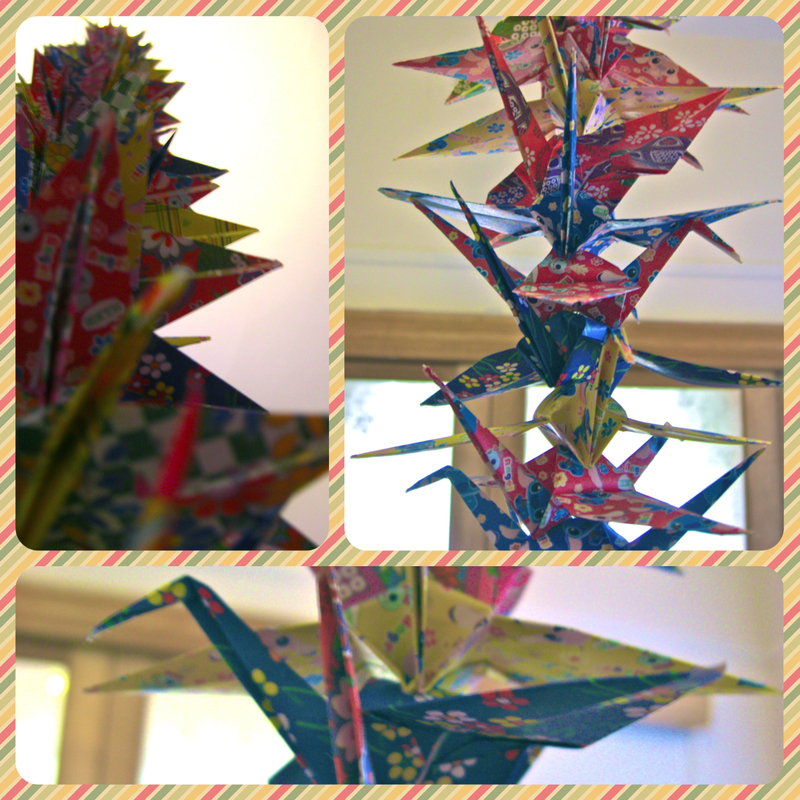 Love the paper cranes. They are so pretty! Lovely post! My recurring theme would be sunflowers, firstly grown in my grandfathers garden, I looked in wonder at their size. Now I try to grow them each year and recently bought a sunflower plate by Arabia, to add to my plate collection.